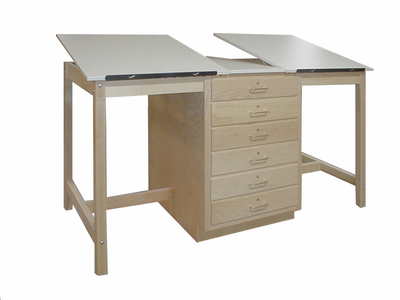 Move your art from the kitchen table to your own dedicated work and storage space with this beautiful and practical two station tilt-top drawing table. HANN Dual Station Drawing Table, Large 6-Drawer Storage Cabinet This two station drawing table with six drawers of built in storage is the perfect solution for artists who want to work without constantly getting up to retrieve needed materials. Made of maple and birch with a Fiberesin top and a mortise and tenon construction, this table is both durable and practical. The tilt top with ratchet type tilting mechanism allows artists to work at the angle that is most comfortable for them, while the adjustable pencil strips help papers and pencils from sliding away. Because of its large size, shipping is $377.90 and it generally takes four to six weeks. 1 out of 5, Based on 1 Reviews.